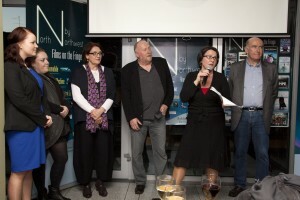 A new film initiative, aimed at introducing European Independent films to new audiences in 5 countries was launched in Galway by Irish Film Board CEO James Hickey on Thursday night 16th October in Galway. 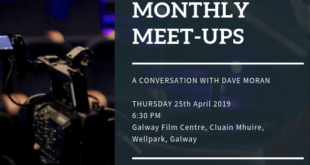 Further strengthening a UNESCO bid for City of Film, Galway based Cinemobile has been awarded funding, as the lead organiser, in a distinctive project commissioned by Creative Europe and the MEDIA Audience Development programme. 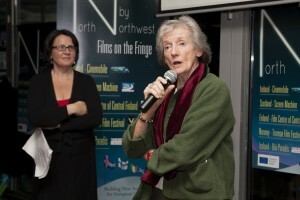 The project North by North West – Films on the Fringe involves Cinemobile partnering with cinemas working in rural parts of Iceland, Finland, Scotland and Norway. Collaboratively the 5 countries involved have curated a selection of films from all their participating territories which will bring European Independent cinema to some of the remotest regions in North Western Europe. The programme begins this weekend as part of the Clones Film Festival with 3 Free Screenings of The Punk Syndrome (Finland), Of Horses and Men (Iceland) and For Those in Peril (Scotland). Friday 31st October sees N x NW – Films on the Fringe travel to Guth Gafa Doc festival in Kells Co Meath with FREE SCREENINGS of Happiness (2014 Finland) and Twin Sisters (Norway). This pilot project involves 5 different cinemas and will bring these country’s outreach strands together in a Europe-wide context. Collaboratively, the 5 cinemas have curated a selection of films from all their participating territories, 28 films in total in 27 different locations, with approximately 45 screenings, which will bring European Independent cinema to some of the remotest regions in North Western Europe. Each partnering country has chosen a selection of its best indigenous films that will be screened FREE in the other 4 countries. 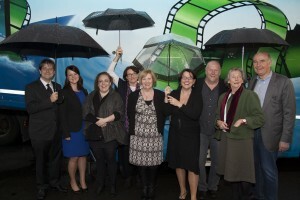 Representatives from Scotland, Iceland and Finland with Cinemobile Manager Noreen Collins, and Irish Film Board executive James Hickey who launched the event. “The project could be seen as a type of FILM SWOP between the 5 countries, which gives audiences a chance to delve into the cinema of other countries a little bit more. We think we have come up with a programme that is distinctive, diverse and quirky. The value of the partnership is that we are similar organisations with similar remits, with a dedicated European art house cinema strand to our programmes. The aim of Films on the Fringe project is to build new audiences specifically for European independent cinema titles in these regions. We want to encourage people who would never dream of going to see a subtitled film to come out and try these films. The aim is that after Film on the Fringe audiences in these countries will be open to watching European titles alongside more mainstream titles, and not necessarily instead of. 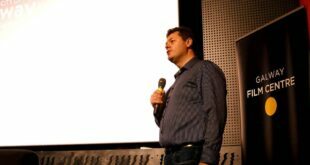 So for this reason it was agreed that the screenings in all 5 countries be delivered free to the public, to encourage people to come out and sample the quality of films that are being produced in Europe right now”. The distinctiveness of this project is its use of fully digitised mobile cinemas and travelling units using portable DCP projectors to screen in small rural towns and community halls, ensuring European cinema reaches the more remote and marginal parts of Europe. 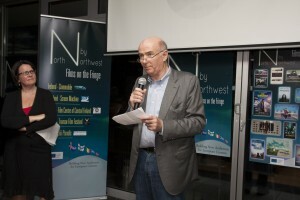 James Hickey, CEO Irish Film Board launching North by North West Films on the Fringe film project in The Kitchen, City Museum. 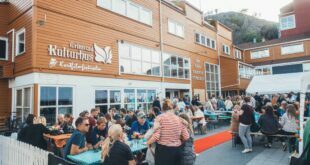 The 5 cinema partners hope to be able to make this innovative cinematic experience an annual event in the film calendar of the countries, out on the edge of Europe.